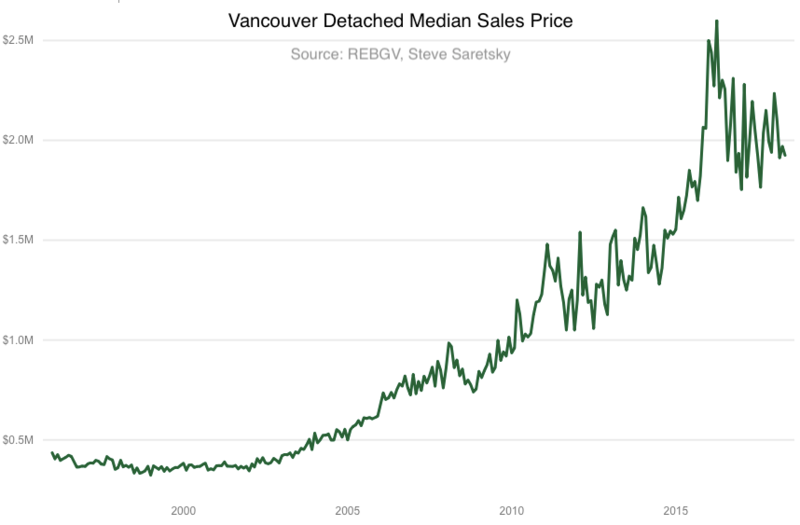 The Vancouver detached housing market has entered truly unchartered territory. Following a sluggish opening to the 2018 year, which saw detached homes slide to near 30-year low in sales, that same trend has continued in May. There were just 231 detached home sales for the month of May, this marked a 39% decline in sales activity year-over-year. This was a record low in sales for the month of May per the Real Estate Board of Greater Vancouver MLS data, which dates back to 1991. 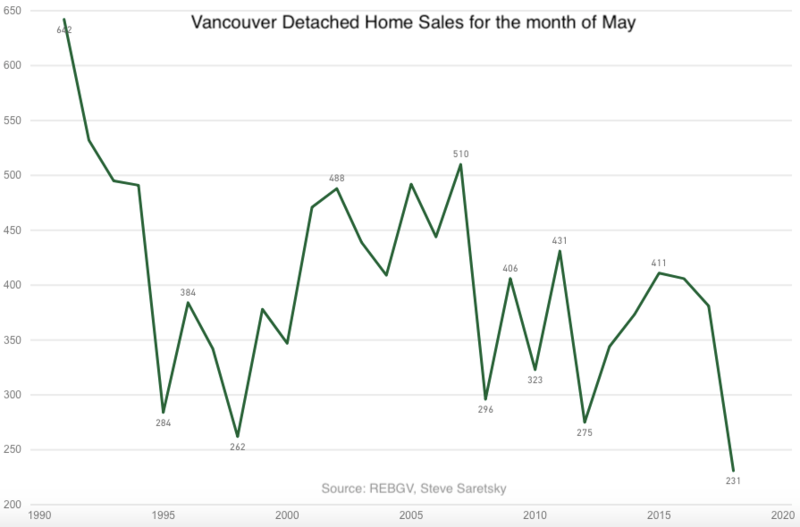 Vancouver Detached Sales for the month of May. Following nearly two years of weak sales, inventory continues to build, topping out at 1769 homes available for sale in the city of Vancouver as of the end of May 2018. For sale inventory has not been this high since October 2012. The combination of a twenty seven year low in sales with a six year high in inventory has not been kind to home prices. 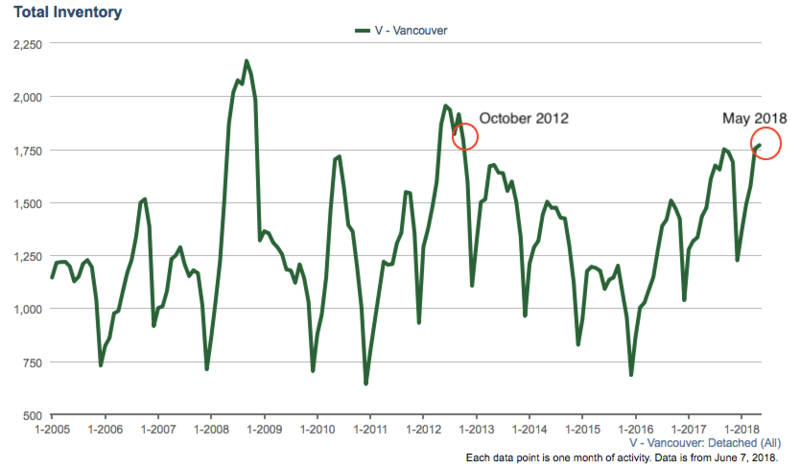 The median sales price of a detached home in the city of Vancouver sunk 12.5% on a year over year basis in May. Unfortunately the Real Estate Boards official MLS benchmark price shows a meager 1.5% decline year-over-year. This has provided a false sense of hope for home sellers, many of whom are convinced prices have not declined. It’s no wonder we have record few sales, prices have not adjusted downwards enough to reflect current market conditions and so we have a no bid situation. Total dollar volumes also fell, dropping 42% in May. This was the equivalent of $448M fewer dollars chasing Vancouver homes and roughly $13M less spent on Real Estate commissions. An important stat considering Real estate commissions, land transfer taxes, legal costs and fees for inspecting and surveying homes makes up nearly 2% of Canadian GDP (larger than the agriculture, forestry, fishing and hunting sector).